Playing havoc with British ships crossing the Atlantic, the SMS Möwe (Seagull) was the most succesful German sea raider in World War I. Disguised as a neutral cargo ship to enable it to get close to targets, the Möwe sunk 40 ships, thus showing that the British did not completely rule the waves and that the Germans were able to break the naval blockade by the Entente. Because of its publicity value the second voyage by the Möwe was filmed by members of the crew. Originally released in four reels by the Bild- und Filmamt (BuFA) in May 1917 as Graf Dohna und seine Möwe, the movie became one of the most important propaganda films in the First World War. Long considered lost, parts of the Möwe film were found recently in the collection of the Dutch Film Museum EYE. A close examination of the footage shows a full match with the ship's log of December 1916 when the Möwe in quick succession sank nine ships about 700 miles off Newfoundland. So, the films were taken during the second voyage of the Möwe and therefore must have been from the original German movie produced by BuFA. Additional scenes, showing the safe return of the raider to Germany in March 1917 and Admiral Scheer congratulating Captain Count Dohna-Scholdien, have been located by the authors in historical stock footage of Periscope Films. During World War I the film mainly was a commercial success in German theatres. But this changed when three years later the movie was released in the United States. According to Terry Ramsaye in his classic book A Million and One Nights, the historical film was found in 1920 by newsreel cameraman Ariel Varges who sent it to America. "It was in the possession of a German secret agent. The agent had an immorata, fair but approachable. She had another gallant friend who was a chauffeur, and the chauffeur, naturally, had several friends, all fair. Captain Varges bought a lot of wine and displayed gold money." Although it makes for a good story there is no evidence available to substantiate Ramsaye's account. Varges was in 1920 in Europe for the Hearst newsreels and trade press reports indicate he secured the film in Vienna. 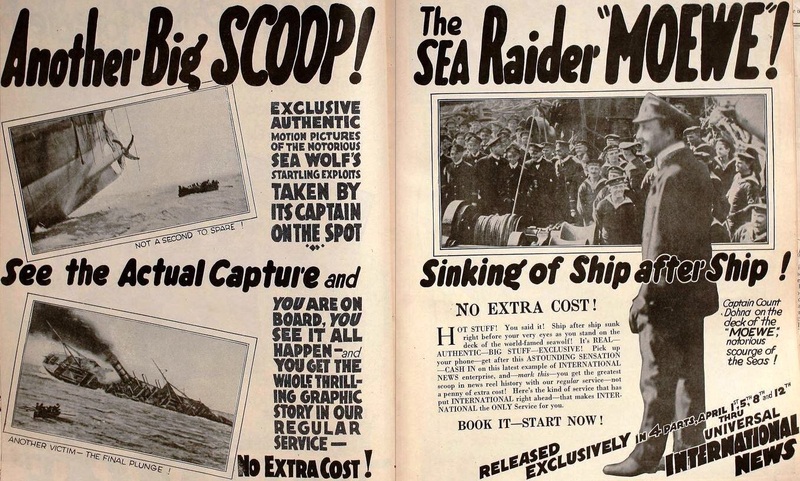 Introduced as The Cruise of the Moewe, "notorious scourge of the seas", the film was released in April 1920 in four weekly segments through Universal International News. After it had been edited for the newsreels, a two-reel compilation was sold by the Hearst organization in America on a state-rights basis. Parts of this American film version are at the National Archives in Washington, D.C. Here is a video from our YouTube channel, showing all historical scenes that had been considered lost on the second voyage of the Möwe. The Dutch version has also been uploaded on the website of the International Documentary Film Festival Amsterdam (IDFA). Albert K. Dawson, the "Kaiser's Cameraman"
While researching the online files of the National Archives in Washington, D.C. the authors recently struck gold. 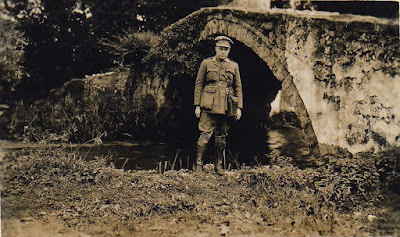 In Record Group 165 "American Unofficial Collection of World War I Photographs" we found a fascinating picture file on Albert K. Dawson - the "Kaiser's Cameraman" - who accompanied the German and Austrian army during World War I. This record group is part of the files of the Historical Branch, War Plans Division, War Department General Staff, and was assembled by the Committee on Public Information (CPI), America's propaganda agency during the First World War. As we dug into this photo collection we found a sub file entitled "Enemy Activities - German Propaganda". As it turns out, the U.S. government collected German propaganda pictures and they made a complete file on Dawson who was considered an interesting subject. 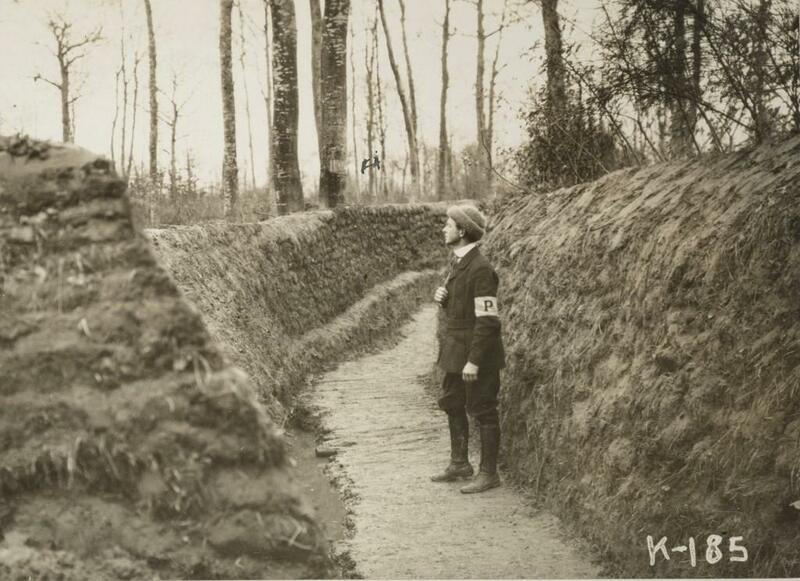 Most of these pictures were collected in December 1918. The description is very accurate and shows a lot more information than what must have been in the original photo captions from 1915. 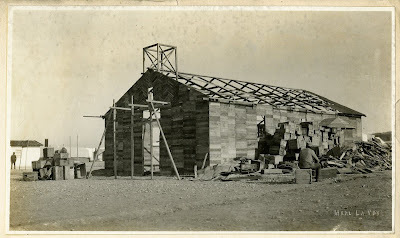 Presumably the editor received more information on Dawson's photographic work in wartime Europe, either from Dawson himself or from the FBI who investigated his work and produced a file on him in 1918. We copied all of these pictures and the quality is simply amazing. There are many new photographs that we had never seen before, notably a picture showing Dawson in the trenches at the western front and another great shot showing him directing a war film in Galicia in the summer of 1915, together with his camera operator John Allen Everets. During World War I when the United States was still neutral Dawson worked for a movie company that was funded by the Germans, producing a series of war films in America. You can read more about his film adventures in our book Shooting the Great War: Albert Dawson and the American Correspondent Film Company (2013). We uploaded this magnificent collection to our photo channel on Flickr, and you are free to download these pictures here. In an earlier weblog we mentioned our discovery of footage shot by American cinematographer Merl laVoy in 1916 with the French forces at Verdun and the Somme. After the release of this movie, on August 25, 1917, LaVoy left the United States for Serbia. Once again, war film shot by LaVoy for this specfic assignment has been found by the authors, this time in the collection of the Imperial War Museum in London. 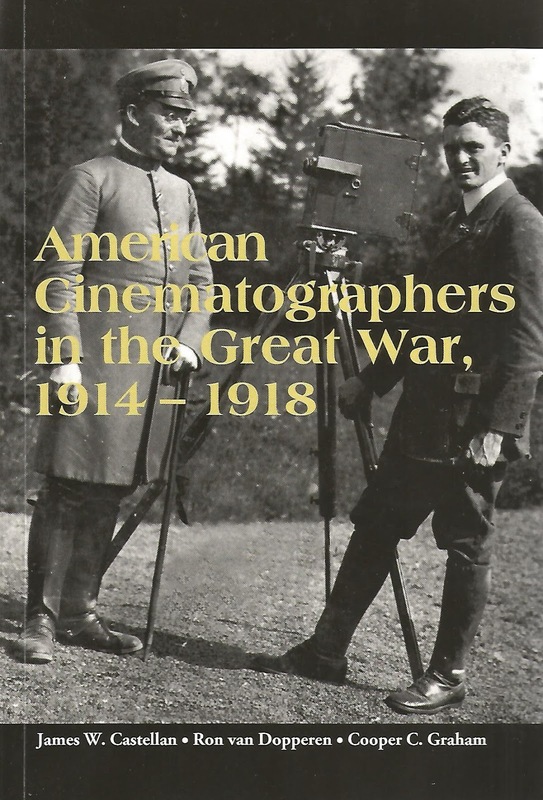 As described in our book American Cinematographers in the Great War, LaVoy was a pioneering cameraman who was nicknamed the Modern Marco Polo because of his numerous travels across the globe for the newsreels. In 2015, we found four reels from his first film project, Heroic France, which was released in the United States in June 1917 through Mutual shortly after the American intervention in the Great War. As it turns out, LaVoy not only worked with the French but for his next photographic assignment he also joined the British forces in Salonika (modern Thessaloniki) in Greece. At the time, Salonika was where the Entente forces had opened a new front, trying to aid the Serbian army that had retreated across the Balkans after the capture of Belgrade in October 1915 by a combined Austro-German army. Recently the Imperial War Museum in London has uploaded on the Internet three reels of footage produced by the War Office Cinema Committee in 1917 under the title British Troops in Salonika -3. The shotsheet, misnumbered as IWM 135, identifies the cameraman as Merl LaVoy. The Imperial War Museum notes: "There is some evidence that he was briefly employed on a semi-official basis by the British government but he could not have filmed all this material." 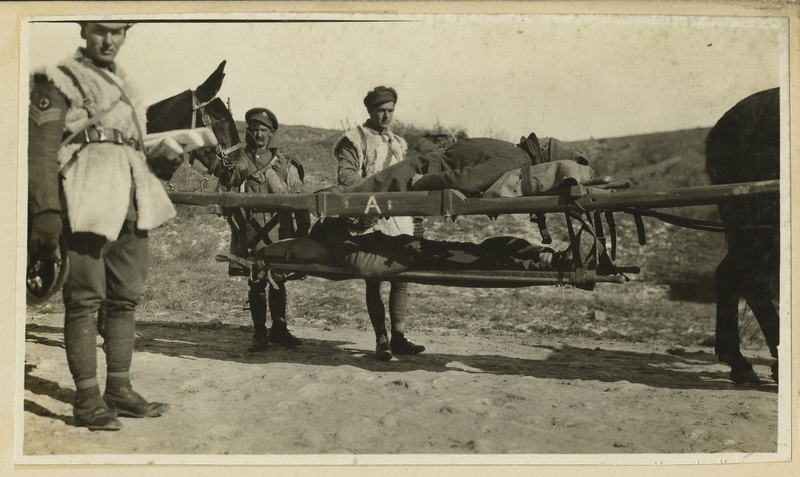 The film mainly features British soldiers from the 22nd Division with scenes showing wounded British soldiers on a mule transport, a British Army camp with a bakery, soldiers washing and eating, scenes shot from an airplane over Salonika harbor and General Guillaumat inspecting the British forces. Here is a video with the scenes credited to LaVoy, taken with the British Expeditionary Army at Salonika. The clip has been uploaded on our YouTube channel for research purposes. 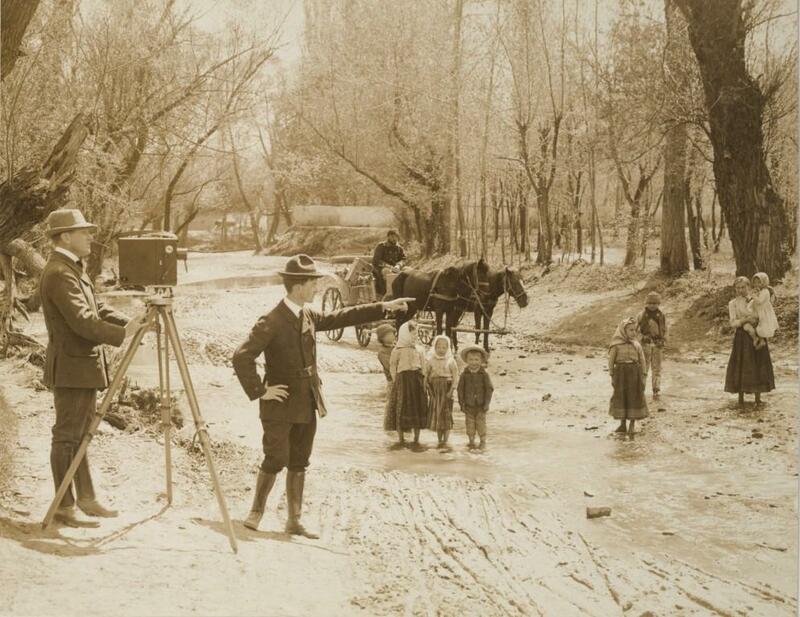 The film scenes found at the Imperial War Museum were possibly edited into LaVoy's second World War I movie Victorious Serbia (1918) which was shown in the United States at local benefit exhibitions by the Red Cross. We were pleased to receive a review recently on our book about the American cinematographers of World War I by the Historical Journal of Film, Radio and Television. Leen Engelen in her review qualified our book as a "pioneering study" on this subject. 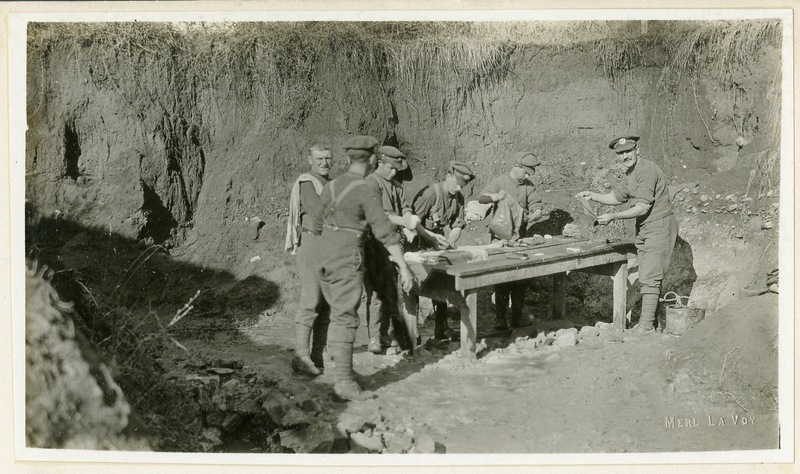 Apart from the extensive research both in America and Europe the book review mentions our work on locating and identifying lost World War I films, such as Wilbur H. Durborough's On the Firing Line with the Germans (1915). "One of the particular strengths of this book", Engelen writes, "is that the authors manage to rime extremely detailed accounts on the cameramen and their films with clear insights into the wider contexts, such as the development of the news business in the war years and the Great War as a global propaganda war." As an example, she mentions the chapter on press tycoon William Randolph Hearst and his influence on modern war reporting by sending his cinematographers to Europe. "Accounts of American correspondents hiding from bombshells in the coal cellar of an Antwerp townhouse or secretely filming at a Marxist demonstration in Petrograd read as exciting boys' fiction adventure stories of young men with cameras, left to their own devices and inventiveness on the battlefields around the world", the review concludes. Thank you for this review! Like the main characters that we described we also felt we were on a great adventure while researching and writing this book. These American cameramen were among the first film correspondents and the Great War served as a strong driving force to innovate the media on a completely new scale and level. This was something people couldn't have imagined a few years before the outbreak of war in 1914. For the first time in modern history wars were being extensively filmed. The review by the Historical Journal of Film, Radio & Television (December 2016) can be read and downloaded here.